switchSENSE® allows for the parallel functionalization of all electrodes within a single flow channel by hybridization of specifically designed sequences with negligible cross-reactivity. Encode up to six different capture molecules with dedicated complementary nanolever sequences using standard kits, and load them onto the chip in a single step. 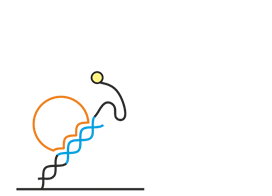 Ligands are immobilized easily onto a switchSENSE® biochip: Standard coupling kits with, for instance, amino- or thiol-reactive linkers are available for the preparation of DNA-ligand conjugates, allowing for repeated functionalization of the chip via automated DNA hybridization. When it comes to sensor performance, a low number of capture molecules means higher sensitivity and better control over binding stoichiometry. switchSENSE® features microelectrodes which are only 120 μm in diameter, and enables the user to adjust the distance between capture molecules. Through a proprietary desorption method, the density of molecules on the detection spot can be tuned for optimal assay conditions. The switchSENSE® biochip is functionalized by DNA–DNA hybridization. While being a reliable method to “zip” capture molecules onto the chip, they can be removed as easily by splitting the DNA duplex using an automated routine. No need to establish unknown regeneration conditions, no need to worry about the activity of capture molecules. The switchSENSE® biochip provides 4 flow channels, each with 6 microelectrodes in series. One switchSENSE® sensor spot (≈0.01 mm2) is populated with nanolevers either of one or two populations at a density of around one million nanolevers per spot. A switchSENSE® experiment is straight forward and easy to perform. First you select a biochip according to the objectives of the experiment, second you functionalize the nanolever with a standard coupling kit and third you start the measurement. The switchSENSE® platform uses one consistent regeneration procedure, irrespective of the type of molecule under investigation. Hence, there is no need to develop or to optimize regeneration conditions. Used capture molecules are efficiently removed by an automated washing step with a basic solution. 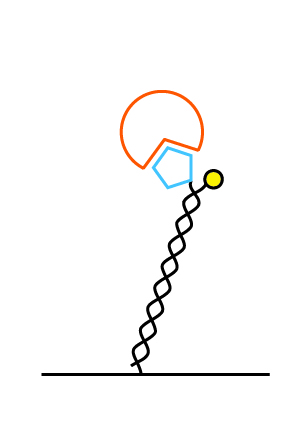 While this treatment denatures the base-pairing between tethered and complementary nanolever, the covalently tethered strand remains on the surface for repeated use. Under optimal conditions a nanolever layer can be regenerated more than 20 times with minimal signal loss. Serum Albumin Human or bovine serum albumin (up to 0.5 mM) 0 – serum conc. Please download the switchSENSE® compatibility sheet for more information. Contact us – we are happy to help. 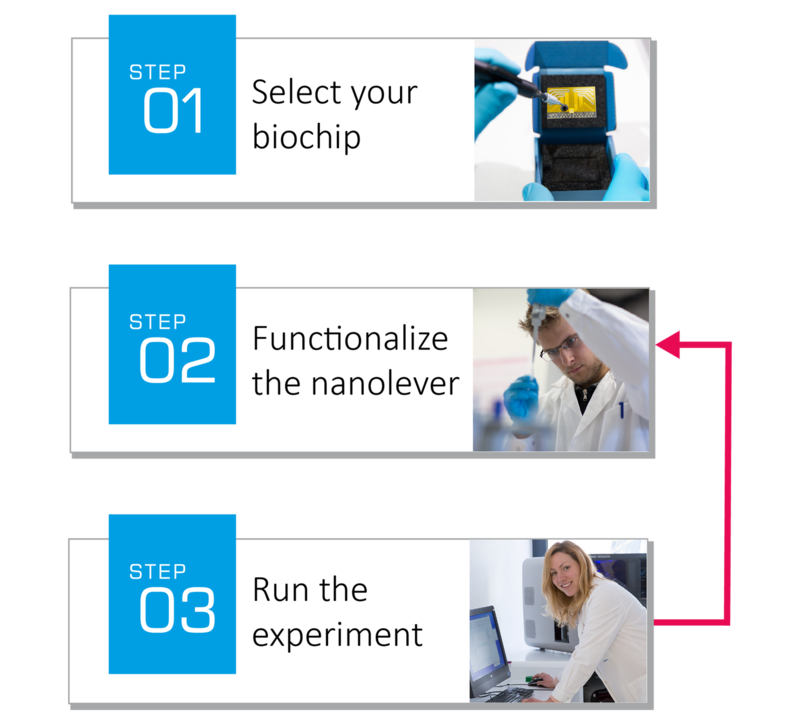 Please follow the 3-step guide below to choose a proper biochip for your experiment. switchSENSE® experiments are performed on a multi-electrode biochip. The biochip features 20 microelectrodes, arranged in 4 separate flow channels that are integrated on-chip for maintenance-free operation. The flow channels are integrated on-chip for maintenance-free operation. The microelectrode surfaces are functionalized with electrically switchable DNA nanolevers and are ready-to-use. We provide a variety of biochips suitable for different experiments. Please choose from the choices given on the right. We offer the multi-purpose-chip (MPC) in two different nanolever lengths: 48 base pairs (16 nm) and 96 base pairs (32 nm). For target complexes below 100 kDa we recommend the MPC with 48 basepairs: MPC-48. For larger complexes (>100 kDa) we recommend the MPC-96 chip with 96 base pairs. 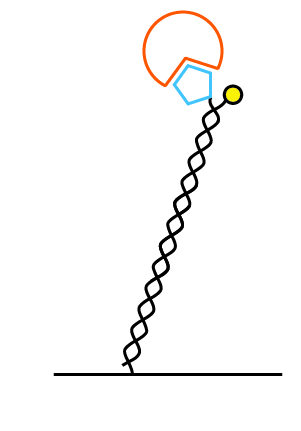 On both types the 5′-end is attached to the surface and the 3′-end carries the fluorophore. All our biochips come with complementary DNA solution for chip storage. 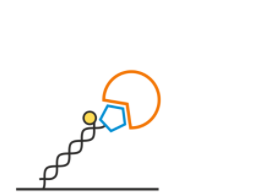 Use the ENZ-80 biochip to characterize DNA binding enzymes, which need a free 3’-end e.g. polymerases. For improved signal to noise ratio and high-end experiments, we replaced the ENZ-54 biochip with the ENZ-80 biochip. Please note: On these biochips the 3’-end is attached to the surface & 5’-end carries the fluorophore. The biochip comes with complementary DNA CNL-P80T80 solution for chip storage. In addition, you receive a 48mer primer to immediately start your polymerase experiments. To resolve fast elongation, we also provide a 36mer primer. 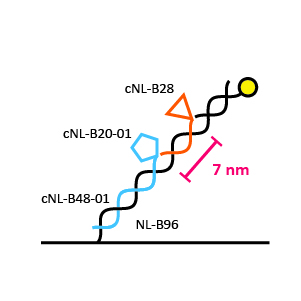 For bispecific binders we offer two different ligand distances on one DNA strand: 7 nm and 14 nm; two (different) ligands can be separated 7 nm or 14 nm depending on the structure of the analyte. The number of different DNA-tether sequences can be chosen according to the experimental requirements. switchSENSE® sensor spots (≈0.01 mm2 ) are populated with nanolevers at a density of around one million nanolevers per spot. With 6 single sequence spots, the electrode functionalization features replicates in favor of better measurement statistics. The biochip design presenting 2 reference sequence and 4 sample sequence spots enables to measure the reference in the same flow channel. On DRX2 biochips, a mixture of two nanolever populations (red & green fluorophors) reside on the same sensor spot. Use one nanolever as the target and the other as the control for absolute data confidence. Of course one can use this set-up also to investigate more complex and challenging issues (e.g. interlinking assays, bispecifics: affinity/avidity,…). The number of flow channels on the chip as well as the number of different DNA-tether sequences can be chosen according to the experimental requirements. If only few interactions need to be investigated, the electrode functionalization can feature replicates in favor of better measurement statistics. If a large number of diverse interactions are to be investigated simultaneously, the chip can be configured for maximal parallelization. Standard grade chips are batch tested, which means selected chips undergo comprehensive quality control (switching dynamics, voltage-response of the DNA layer, and fluorescence levels). In addition, the fluorescence levels on each electrode are tested to be within specifications. Due to the production process not all detection spots fulfill our high quality standards. It is guaranteed that 20 or more detection spots are QC approved. We recommend standard grade biochips for testing new assays and to obtain first results. 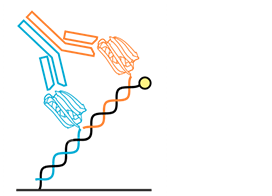 All biochips are available as performance verified versions upon request. Performance verified chips are especially selected and each detection spot is extensively tested under application conditions and QC approved. Comprehensive QC documentation of performance indicators is provided with every chip for consistent traceability of results. Recommended for use in QC or GxP environments. Please contact order@dynamic-biosensors.com for details. Standard grade chips are tested for proper fluorescent levels on each spot. Further these chips get batch tested for proper switching dynamics, calibration (voltage-response of the DNA layer) and fluorescence levels hybridization. In this process also each of the four flow channels is regenerated and the hybridization kinetics and efficiencies are recorded in a standardized environment (temperature, buffers, DNA concentration). Contact us, we will get in touch with you shortly! Multi-purpose chips are versatile means to analyze protein-protein, protein-small molecule, DNA/RNA-protein, and DNA/RNA-small molecule interactions. By exchanging the standard complementary DNA strand, the chip design enables users to build a near infinite range of molecular structures. 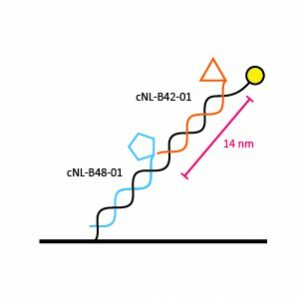 Choose from two different nanolevers: standard DNA levers comprise 48 bp and are 16 nm long, or use 96 bp (32 nm) levers for large analytes. Email order@dynamic-biosensors.com for ordering and product information. The switchSENSE® multi-purpose chip MP3 with its three predefined ligand surface densities makes it easy to experiment with different and ultra-low densities, and ensures quick experimental success even for challenging interactants. For further, detailed information CLICK HERE. Email order@dynamic-biosensors.com for ordering and product information. 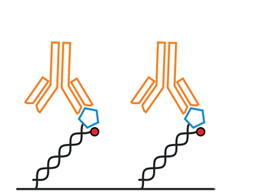 Traditional methods used in the study of bi-functional antibodies can often fail to discriminate between complex binding modes (monovalent versus bivalent or bispecific). The new switchSENSE® Bi-functional Chips offer a very flexible and powerful platform for both research and quality control in production. Multiple binding events can be studied either through the use of bi-functional nanolevers that present two different ligands at the same time or through a heterogeneous design where two nanolevers species are immobilized in direct proximity. Email order@dynamic-biosensors.com for ordering and product information. Our unique enzyme chips are designed to analyze the activity of polymerases and nucleases. Elongation rates, exo- or endonuclease activity, hot start properties, and many other parameters can be analyzed cost efficient and non-hazardous in fully automated, radiation free, and rapid protocols. Label-free polymerase assays are ready-to-use. The nanolever structure consists of a double stranded primer part and a single stranded template. Two versions with different Primer lengths (36 bp Primer and 48 bp Primer) are available: P36T80 and P48T80. The kit includes unlabeled complementary DNA. Email order@dynamic-biosensors.com for ordering and product information. Please download the switchSENSE® Biochip Storage Information for optimal storage of your chips. Custom biochips with tailor-made surface modifications are available upon request. Please contact order@dynamic-biosensors.com and describe your application. A chip specialist will get in touch with you shortly to discuss technical requirements, solutions, and provide you with timeline and cost estimates. Didn´t find the information you were looking for?